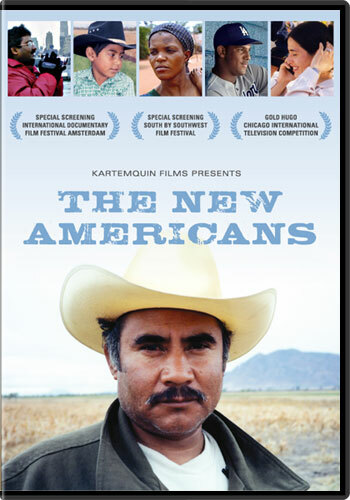 The New Americans follows four years in the lives of a diverse group of contemporary immigrants and refugees as they journey to start new lives in America. We follow an Indian couple to Silicon Valley through the dot-com boom and bust. A Mexican meatpacker struggles to reunite his family in rural Kansas. Two families of Nigerian refugees (including the sister of slain Ogoni activist, Ken Saro-Wiwa) escape government persecution. Two Los Angeles Dodgers prospects follow their big dreams of escaping the barrios of the Dominican Republic. A Palestinian woman who marries into a new life in Chicago only to discover in the wake of September 11, she cannot leave behind the pain of her homeland's conflict. Kartemquin assembled a team of talented directors including the creators of Hoop Dreams, Who Killed Vincent Chin, and Vietnam, Long Time Coming. The detailed portraits that resulted were woven into a seven-hour miniseries that presents a kaleidoscopic picture of immigrant life and a first impression of the U.S. that few born in America can imagine. 2-Disc Set Extras:Additional Scenes, Spanish Secondary Audio Track, Where Are They Now Slideshow, ability to play separate stories in chronological order.